DILG Secretary Robredo keynotes the Launching of the “Fully Abled Nation” on April 18, 2012, Shangri-La Hotel, Makati City. Congratulations to the launching of Fully Abled Nation, I believe that a program seeking to increase the participation of PWDs in the coming 2013 Philippine midterm elections is truly a revolutionary one. Most people assume that disability is only a social welfare concern. It is in fact, a human rights issue. While we need special lanes or walkways, buildings with wider doorways, and other facilities for PWDs, there is something equally important that is often overlooked – and that is the right to vote. We know how difficult it is for persons with disability (PWDs) to exercise their right to suffrage. According to an SWS survey of PWDs and Filipino adults, there was a drop in the participant of PWDs in elections. The number of PWDs who voted in 2007 decreased from 60% down to 54% in 2010. Those who registered but did not vote rose from 14% to 21%. On the other hand, some 22% PWDs of voting age did not even bother to register. Among those who did not vote in the 2010 elections, 17% were ashamed to vote because of their disability, another 17% because of mobility problems, 16% because they were either sick or bedridden, and 10% because nobody would shade or read the ballot for them. PPCRV Chair Henrietta de Villa estimated around 9-Million Filipinos are PWDs, and some 2.6-Million to 3-Million are in fact, qualified to vote. However, COMELEC only has 742,228 registered PWDs in its records as of January 2012. However despite their number, and the COMELEC special registration of PWDs, many PWDs still find it difficult to register and vote because of the different and difficult circumstances they face. I agree with COMELEC Commissioner Rene Sarmiento that we need more registration sites, more accessible polling precincts, perhaps ballots printed in Braille, sign language interpreters for PWDs, among others, to be able to help PWDs exercise their right to vote. It is true that PWDs have continuously pounded on the table for everyone to take notice. It was the community of the disabled themselves who worked tirelessly and insistently to promote their rights. I have always rallied behind this cause because I am no stranger to PWDs. My father is blind. He had been stricken with a rare eye ailment and has been blind ever since I was four years old. Since the ailment is hereditary, three of my siblings are also blind. Visual impairment runs in the family. That’s why when I say I know how you feel, I really mean it. As a former mayor of Naga, we have given PWDs a voice by giving them a seat at the table. We made sure that PWDs are represented in the Naga City People’s Council so that we can listen and respond to their needs. Before I left as mayor, we have already set up a resource center for the blind in the city, where we have books in Braille and a computer program which allows them to use the Internet. Now as the Secretary of the Interior and Local Government, I have pursued several initiatives to promote the rights and welfare of PWDs. Local governments units (LGUs) must pay attention to the needs of PWDs. In September 2010, I have issued a memorandum to all governors, city and municipal mayors to create PDAO of Persons with Disability Affairs Office. LGUs are mandated by the Magna Carta for Disabled Persons to organize and establish PDAO in every province, city and municipality. Section 4 of RA 10070 provides for the allocation of LGU funds from local revenues for the implementation of PDAO activities and for the PDAO funding to be included in the LGUs Annual Plans and Budget. In consideration of budget constraints, mayors of 4th, 5th and 6th class municipalities, in lieu of the creation of a PDAO, may designate a PWD focal person who shall perform the functions of the PDAO. My directive requires the PDAO or the PWD Focal person to formulate and implement policies, plans and programs for promotion of welfare of PWDs. It requires them to coordinate and implement the provision of RA 10070 or the Magna Carta; Batas Pambansa344 or the Accessibility Law; and other relevant laws at the local level. They are also tasked to: One, gather and compile statistics and relevant data on PWDs in their localities; Two, disseminate information on programs and activities for PWDS including children with disability; and Three, train and create employment opportunities, among others. Likewise, LGUs are to create a Local Council or Committee for the Welfare of Disabled Persons. The Department has also issued a memorandum circular as early as 2009 calling all local chief executives (LCEs) to establish health desks in their rural health units to attend to the health needs of PWDs. These desks should be manned by rural health officers (RHOs) to take care of PWDs. RHOs are to submit reports on a regular basis to the Department of Health (DOH) on the number of persons served and other relevant details. We are one with you in your aspirations for our PWDs. We will reiterate all these directives and come up with a monitoring mechanism this year to push for full compliance across all LGUs in the country. 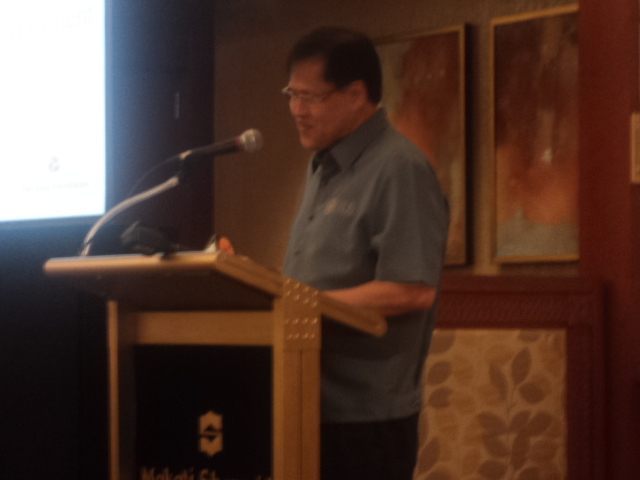 The DILG wants to achieve PWD-responsive LGUs. Those that put premium on the welfare and protection of the rights of the PWDs as well as mainstreaming of disability issues within their jurisdiction. I know that this advocacy cannot move without funding. So, to achieve this goal, e have to intensify capacity building of local officials and provide funds for training programs for PWDs; mainstream disability concerns in the local planning, programming, budgeting, implementation, monitoring and evaluation and local legislation; intensify advocacy on existing laws related to PWDs rights and privilege and push for LGUs’ compliance; and allocate a percentage of LGUs budgets provided for in Sections 33 and 34 of GAA, for the implementation of plans, programs and projects for PWDs as well as promote their participation in elections and other democratic processes. There is much work that remains to be done to produce results. While we don’t have a magic wand to make them all happen overnight, I assure you that the government and may concerned groups and individuals are working tirelessly to break the barriers for people with disabilities. Thank you to Asia Foundation and to the Australian AID for your support. The collaboration of the Foundation with our Disabled Peoples Organizations, COMELEC, PPCRV, LGUs, NGOs and CSOs partners and other stakeholders are also key to the success of the program. Our concerted efforts should include vigorous campaign for our lawmakers to push for the rights of PWDs to vote. All of us have the moral duty to break barriers for people with disabilities. For societies to truly function, no one should be left behind.